I've customized a SharePoint list form using PowerApps and I don't see an option anywhere that would allow me to make the app large or responsive. So far PowerApps-customized forms look like a joke. Does anyone know if there is a way to "stretch" this form? I know, that Microsoft might think that it's so small because it's "mobile first". But the thing is that PowerApps-customized forms don't show in SharePoint mobile apps anyway. So what's the point of these PowerApps being so slim? Can someone, please comment on it? The modern SharePoint lists are built using React framework I believe. This way the form loads without a page reload happening. The forms loads within a Canvas which is on the same page(List). Even I couldn't find a way of resizing this canvas. An app created here could be resized but possibly not the list form. 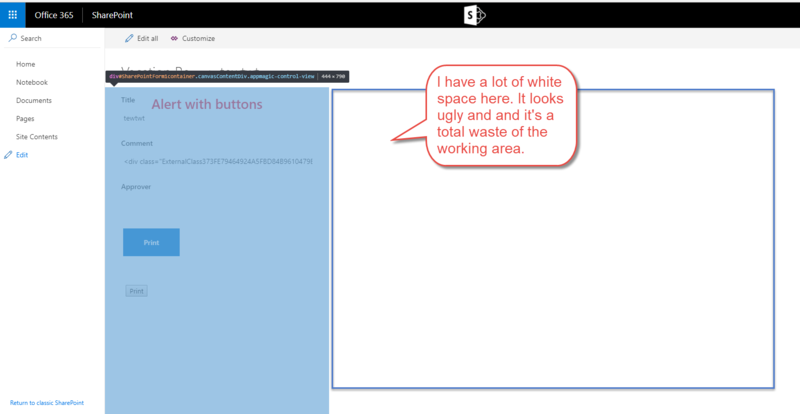 At the moment, PowerApps-customized SharePoint list forms do not support resizing. Create the full PowerApp. If you do that you will have to either jump from one URL to another between PowerApps and SharePoint. Click on Screen size + Orientation. Then select the Orientation you want (Portrait or Landscape) and whether you want it small or large. Make sure you click on Apply in the bottom right of the screen (it doesn’t really jump out at you). Pick the landscape option, and then go back to your form and you'll be able to drag the fields out to the new wider width, then just save and publish. Per my test in my SharePoint online environment, I customize the list from in PowerApps. When I create new item or edit the item, there is no such white space in the form. Switch to other browser to check if the same issue will occur. Using PowerApps to customize the list form is the new feature. And it will be improved in the future. Per my test in my SharePoint online environment, by default it will not open a new tab when I create a new item or edit the item. Not the answer you're looking for? Browse other questions tagged sharepoint-online office-365 powerapp or ask your own question.